The location phrase is a type of preposition phrase. It always occurs before the verb phrase (as in preposition phrase). 1. I am reading at the library. 2. I have my breakfast in the cafeteria at school. The time phrase (that indicates the ‘time when’ a situation takes place) always occurs before the verb phrase (as in preposition phrase). 1. I run to school every day. 2. I bought several books yesterday. However, the time phrase may also occur before the subject. Within the time phrase, the order of constituents is from the largest block of time to the smallest block of time. 2. 8 o’clock last night. When a sentence includes both a time phrase and a location phrase, time phrase generally occurs before location phrase. 现在我在工作但我不忙　哈哈。　I am enjoying your blog! 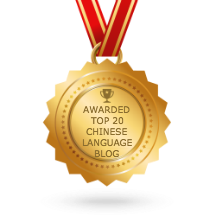 I am glad to hear that you are enjoying my blog and learning Chinese. Yes. Tones are important to Chinese pronunciation and used to distinguish words with same Pinyin. If you want to learn to speak Chinese, you have to learn the 4 tones. I am in the mid of preparing an Pinyin audio e-book. Register to my website so you will get updated. I hope you enjoy learning Chinese. Great job and congratulation for sharing your knowledge freely. Your chinese lessons are far the best I ever learnt. Thanks for visiting my site. Hopefully this grammar lessons are useful to you. Btw, i’m half chinese, and my mom who is chinese born woman living in denmark also thinks that this was so easy to understand, keep up the good work! Hope these grammar lessons are helpful to you. its like adverb of place and adverb of time right? Yes. Some of the adverb of place are : 这里 (zhè lǐ ), 到处 (dào chù). That’s great! It is an easy way to learn how to order the sentences correctly in the exam! I am a beginner by the way! Wo ai hanyu shuo! Thanks. I hope the lessons are helpful. How to say, I yesterday, from the market, for my friend, bought a bag. This sentence would include time, location and prepositional phrase. So what should be the order then? Where should ‘for my friend’ come? Thank you! I was really struggling with this for HSK3! Great to hear that this article is helpful to you.